Bryan Municipal Utilities (BMU) has a vested interest in the economic vitality and growth of our community. Economic development can benefit Bryan not only through job retention and creation, but by reducing the average cost of utility service to all customers. Electric service reliability and costs are critical elements of success for many firms and an important consideration in business retention, expansion and attraction decisions. 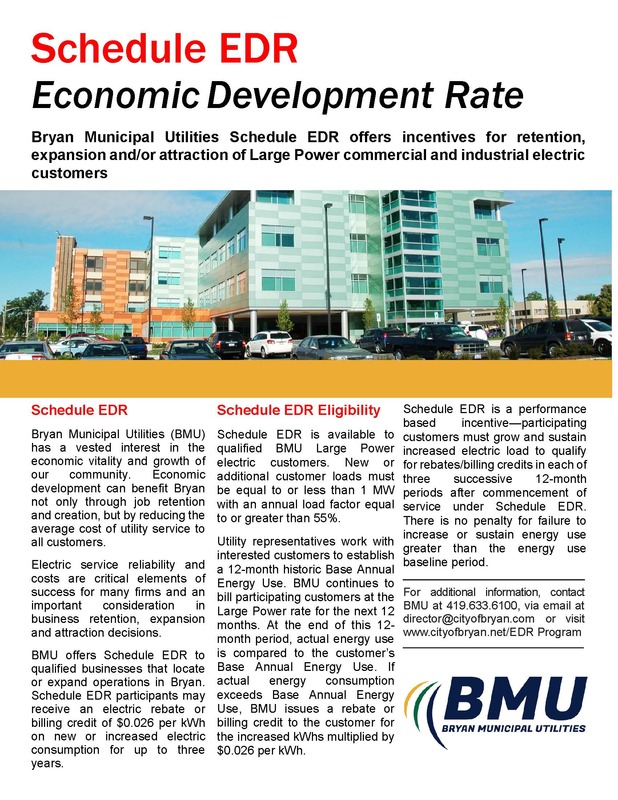 BMU offers Schedule EDR to qualified businesses that locate or expand operations in Bryan. Schedule EDR participants may receive an electric rebate or billing credit of $0.026 per kWh on new or increased electric consumption for up to three years.